Yesterday evening(November 18th) Jenna Coleman made her to the red carpet for the 2018 Evening Standard Theatre Awards at the Theatre Royal in London. 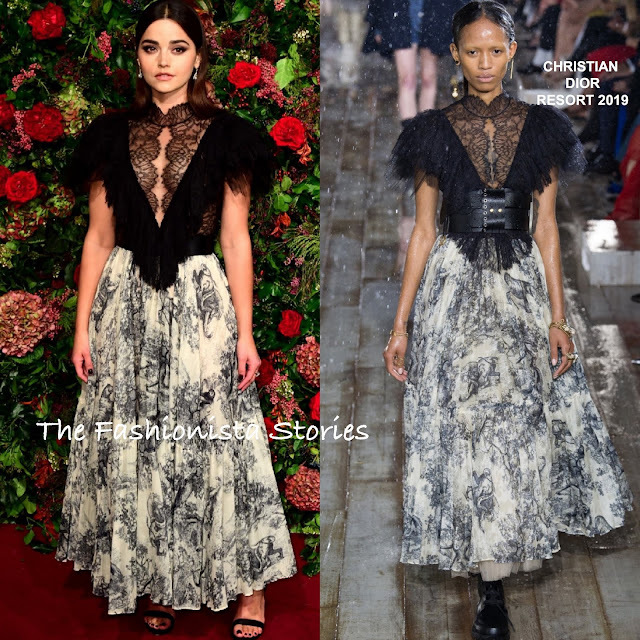 The actress stepped out in a CHRISTIAN DIOR RESORT 2019 ankle length dress which featured a black ruffle lace top and a printed, pleated skirt. On the runway, Jenna's dress was belted at the waist, with an over-sized belt that was shown through-out this collection. While the dress kinda works with the belt, I prefer it on Jenna without it. Straight behind-the-ear tresses, smokey eyes and black sandals finished up her look. Are you missing the belt?